STUDIO CITY, CA -- September 24, 2015 -- Hallmark Channel announces the start of production on “Chesapeake Shores,” a series of Hallmark Channel original movies debuting on the network in 2016. The film, which begins shooting this week in Vancouver, is based on the novels of the same name by New York Times bestselling author Sherryl Woods. Jesse Metcalfe (“Dallas,” “Desperate Housewives”) stars alongside Meghan Ory (“Once Upon A Time”), Golden Globe® nominated actor Treat Williams (“Everwood,” “Hair”), Academy Award® nominee Diane Ladd (“Wild At Heart”) and Barbara Niven (“Debbie Macomber’s Cedar Cove”) in this epic, multi-generational family drama. Ory portrays Abby O’Brien – a high-powered career woman, divorcee and mother to two young daughters. After years away from her family, she takes a trip from New York City to her hometown of Chesapeake Shores. The visit brings her face to face with her past, including her high school sweetheart Trace (Metcalfe), her undemonstrative father Mick (Williams), her daring sister Jess, and her beloved grandmother Nell. This trip also makes Abby notice the toll her career has taken on her ability to be a hands-on mother to her daughters. As she spends more time in her charming hometown, Abby begins to consider a permanent move to the town she once called home -- Chesapeake Shores. Metcalfe portrays Trace Riley, a handsome musician who was Abby’s first love. After high school, Abby abruptly left Trace and Chesapeake Shores without warning, an action he has never forgiven her for. Trace eventually follows his dreams to become a musician, only to return to Chesapeake Shores years later and find that Abby, too, is back in their hometown. The two remember what they once had, sparking deep and unresolved emotions. Williams portrays Mick O’Brien, the commanding patriarch of the O’Brien clan. Mick’s wife walked out on him years ago, leaving him a single father working hard to provide for his family. Unfortunately his work took precedent, which made him emotionally unavailable to his children. When his daughter Abby returns home, it marks a new beginning for Mick and Abby as they work to reconnect and repair their strained relationship. Ladd portrays Nell O’Brien, the beloved matriarch of the O’Brien clan and Mick’s mother. She is a warm, maternal and wise woman -- with a lovely Irish lilt – who took over rearing of the O’Brien brood when her son’s wife, Megan, abandons the family. Through the decades, she is the glue that keeps the fractious, fractured family together. Niven portrays Megan, Mick O’Brien’s estranged wife. 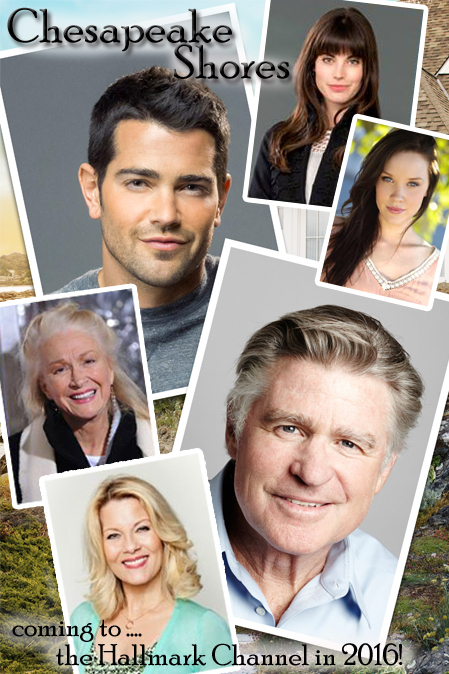 Are you a fan of Woods' Chesapeake Shores series? Will you be watching the Hallmark movies next year? Are you happy with the actors that have been cast? Are they as you visualized the characters? I'm delighted to see Hallmark bringing romance novels into our homes through their television movies. I'm of a fan of the Cedar Cove series (based on Debbie Macomber's books) and the Christmas movie, The Nine Lives of Christmas, based on the Sheila Roberts book of the same title. What book or book series would you like to see on the Hallmark Channel? Mallery buchanan series - would love to see grandma's redemption. Yes I love Wood's Chesapeake Shores series!! I would like to see what they would do with Susan Mallery's Fools Gold series. That would be another interesting one. I would love to see one of Carr's series on screen. I think the Virgin River series would be a wonderful TV series. There are some nice western romance series, but Westerns don't seem to be in fashion anymore. I agree but I'm so invested in those books I'm not sure I'd be able to forgive Hallmark if the casting/writing didn't measure up to my expectations. I'd have to let go of the books and be able to enjoy the TV series on its own. So wonderful to bring this series to TV. Can't wait. I think the actors chosen are great choices. I'm with Pamela on bringing Fool's Gold to TV also. While I've never read the books, I believe they will make an excellent TV series just as Debbie Macomber's Cedar Cove books have done. I have enjoyed reading the Sarah Woolson Mystery series written by Shirley Tallman. It's about a female lawyer set in the late 19th century in San Francisco. There are 5 books so far and a 6th one waiting to be published. I think it would make a great TV series.